I was minding my own business…. So much for trying to ignore CVID info. This link came in the mail and I went and read it. I decided I had to go on an expedition. I ran out of checks, so went to the bank so I can pay my rent. Then I went to the park for free food. It was only the second time this month I went for free food, and the first time we met in the park in a long time. I got a few things from FNB, then went grocery shopping. I really needed to buy more Metamucil! Then I spent $90. Gulp. It sure doesn’t buy much. Even though the air is thick with air pollution, chemtrails in x’s were being put all over the sky. Within a couple of hours, all traces of blue sky were gone. Even when most of the sidewalks are clear, there are plenty of obstacles for folks like me in wheelchairs. Like impassable curb cuts. Between noon and 1 PM, the air was thick and the sky gray. Temperature inversions here are really gross and disgusting! By the time I got home, my right lung felt like it wasn’t moving and working right. Elephants are sitting on my chest. Ouch. It’s been quite awhile since I was able to do all this stuff. Dang. My heart is pounding like crazy. Now I get to rest…I hope. I have been resting for 5 hours now, and my lungs aren’t getting better 😦 If I take in much of a deep breath, the pain goes from my chest, through to my back. I am not amused. I had better not be getting pneumonia or pleurisy or whatever. My face is red. I feel yucky from head to toe. And my thighs and upper arms are swollen and wicked bad painful again…so is the back of my head. An IVIg is just as elusive as ever. I still can’t bring myself to be too excited about the CVID diagnosis. It seems pointless to learn much more about it until the immunologist agrees it’s correct. I am really, really tired of learning medical stuff! All I want to know about is feeling better. Everybody and their brother here at the apartment building are worried about me. It’s common knowledge that I look awful and am acting strange. The second I roll out the door of my place, people get all concerned and ask a zillion questions. I am more likely to cry and flee than answer. I don’t know what to say. My body and brain just aren’t working right. As long as I can stay focused, what I write makes a heck of a lot more sense than what I say…and nobody can see me cry. I was in horrible pain last night. There was absolutely no comfortable position. My thighs and upper arms were exquisitely painful to the touch and almost unbearable even if I didn’t touch them. If they have ever hurt that much, in that way before, I sure don’t remember it. Also, my knee and shoulder joints had me crying, as did my often felt costochondritis. Here’s my breakfast. 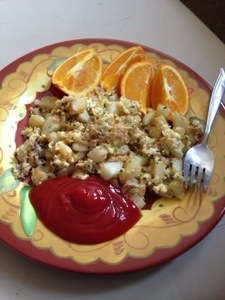 Scrambled eggs and potatoes with chives and Parmesan and an orange. My guts have been acting up since yesterday. Ugh. Hurts 😦 My belly wound seems to be doing somewhat better. It still bleeds, but seems to be healing faster now that I am slathering it with bag balm. I hope so! The active ingredient in bag balm is 8-hydroxyquinoline sulfate 0.3%. I have to admit that this scares me because meds with “sulf” in the name usually make me sick. I wish I had someone to pal around with. I have many friends and acquaintances, but nobody to just grab and go. I want to go out to eat for my birthday, but it’s not much fun alone. OK…back to my belly. I just took a picture of what’s left to heal. The left of the picture is my right. Because the camera is so close to my belly and so far from my head, it looks out of proportion. The side with the belly button is the side with the hernia. I am hoping the red bumps on the open sore are granulations, the beginning of new skin. I just left the apartment to take out the garbage. The manager intercepted it and took it for me. I called my neighbor “Helen” and instantly knew that wasn’t right. Then I asked what her name is. I had to ask several times. She thought I was joking. Then I burst into tears and quick came back to my apartment. More and more, I am thinking something bad happened to my head last week. I just don’t know what. Yes!!! Made it to church! I felt yucky all night and morning, but tried pretending I was fine 🙂 Going seemed like an adventure. At first the outside world was a real novelty. I made it to church with only a few difficult icy patches. Used the Spiriva inhaler at home, then albuterol once I was in the building. Lots of coughing, blowing my nose, dabbing my eyes and clearing my throat, but I did pretty well. The speakers were a couple from India. They sold everything they owned to come to SLC so the guy could go to the U. They have a 1 year old and 5 year old. Their talks were fantastic! I only stayed for sacrament meeting. By the time I was a third of the way home, I just wanted it to be over. Enough endurance kicked in that I made it home. Sooooooo wiped out and soooooooo sore. I did a bunch of moaning and groaning when I got out of the power chair. Dang! It was extremely difficult to use the bathroom and change my clothes. I was very afraid of falling, even when holding onto my walker for dear life. I am so weak that I feel like I weigh a bazillion pounds. I nuked yesterday’s crockpot meal for lunch. Now I weigh a bazillion and one pounds. I took out the garbage and got today’s mail. Two people wanted to talk. I wasn’t very good at talking. My voice worked, but my brain didn’t. I wasn’t able to speak correctly. My sentences were all chopped up and I didn’t make a whole lot of sense. It freaked me out so I excused myself and quick came back to my apartment. What’s happening to me? Yikes! I seem to write OK…don’t I? Well, I went to bed at 7 PM and got up at 6 AM. I still look and feel like heck. I put on clothes to get yesterday’s mail. My hair looked awful, but I figured no one would be out there. Ha! I ran into the woman who washes my clothes, the stomper and my favorite old guy. The laundress has 2 ulcers, my neighbor dropped dead, the stomper has her dog back and the old guy was bitching about tepid water. I am afraid I wasn’t very empathetic to the old guy. He was complaining that the water wasn’t hot enough when he was shaving. I had just heard about Lee, so water temperature sounded pretty trivial. I told him that I spent much of my adult life without hot running water. It’s simple…you heat up water on the stove! You can then use it in the sink or pour it over your head in the shower. No big deal! Just before Christmas, one of the boilers here quit working. It hasn’t affected me…probably because I am on the first floor, close to the source. Heck, in Florida I turned off my water heater to save money. It’s the least of my worries. The forecast calls for a week of no precipitation. I keep wanting to go shopping while the sidewalks are clear, but I doubt I have the strength and stamina to go a block. And if I use up energy for shopping, I won’t have a hope of making it to church. It’s kind of scary to realize the farthest I have been from my apartment this week is to the dumpster. Each time I took out the trash, it took hours to recover. I have the crockpot going. 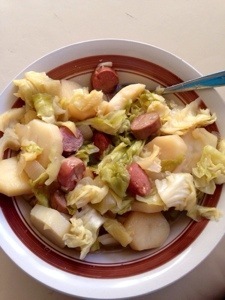 Sliced potatoes, diced onions, chopped cabbage, Polish sausage slices, apple chunks, apple juice and spices. I am soooo thankful for a crockpot! It stretches the limit of my endurance to cut stuff up. I don’t have strength left to stand at the stove cooking. Well, enough of me for now….. This morning Chris the nurse came to my door. He wanted to say hi since he was here for another patient in this building. I could tell by his face that he was shocked by how sick I look. I was surprised at how horrible 3 minutes of talking made me feel! The air is getting more disgusting by the minute. These temperature inversions are tough on my eyes and lungs. I don’t know what to do. The arthritis has me almost immobile. All my lymphs are swollen. I am a stuck record. I don’t know anything that will make me better, except IVIg. I am sooooooo miserable!!!!!! When I was in public school and college or working at an outside job, holidays were great because it meant vacation. Now that I am old, single and disabled, holidays are mostly a bother. It means disruptions in healthcare, mail, grocery shopping and the day to day mundane stuff…like what’s on TV. I woke up this morning feeling huge relief. I can feel sick without trying to be cheerful and available. Why is it OK to be alone and ignored most of the time, then people think it’s so awful for Christmas? The news was chock full of carload after carload of food, toys and warm clothes being dropped off at the homeless shelter. Instead of cheering me up, it made me sad. Those families needed the love, care and goods BEFORE they became homeless. Giving to the homeless at Christmas is politically correct and a feel-good thing. It is knee jerk, simplistic thinking. Funny how there aren’t enough affordable places to live, food stamps are cut, minimum and other wages are too low, unemployment benefits expire quickly, etc, etc. It’s not cool to help people who are struggling, but at least for Christmas, those same looked down on people are objects of pity and generosity. Something is wrong with this picture. It’s easy to dig a few old cans of food out of the cupboard, thin out the ugly and Ill fitting clothes, buy a few cheap presents for the kids and feel like real help has been offered. If only it were that simple! The biggest problem is government policies. Citizens must live with the consequences of war, lack of mental health care, poor support for affordable housing, trade agreements, taxes, lack of unionization, lax environmental laws, high cost of healthcare, food policies such as the protection of huge agribusinesses, laws that protect business before individuals, and all sorts of social and economic injustices. The government is in power to protect big business, not to protect regular old people. The deck is stacked so the rich get richer and the poor get poorer. That’s what I saw for Christmas. Don’t get me wrong, donating unused stuff is admirable, but it doesn’t make up for government policy or the political climate that pits most people against each other, instead of the root causes. No fooling! The government spends waaaay too much money. What is it with the perception that poor people are bankrupting the country? That spending is a pittance compared to the military industrial boondoggle; bailing out banks, Wall Street and corporations; tax loopholes for corporations and the very rich and all other money spent to make sure that people who already have a high standard of living can keep living that way off the backs of normal people. It’s sick. Busy people often don’t have the time or interest to get deeply into studying history and current events. If just a few overly simplistic slogans and paragraphs are all that’s known, how the heck are people making informed decisions? The more cleverly crafted rhetoric and graphs grab attention. How many people have the critical thinking skills to sort out truth from fiction? I recently read a list about what’s wrong with America. It was full of deliberately shocking “statistics”. Mostly it was comparing one year of one thing to ten years of another. Or very specific data to intentionally vague numbers. All were skewed for creating outrage. Information was manipulated to support a certain point of view. What we need is more thoughtful discussion and less flinging of garbage. There will always be bullies who are louder or stronger. That doesn’t mean they are right, just obnoxious. Good people need to stand up for what is good and right. There shouldn’t be sides. We all have to share this earth. What happened to most good, least harm and individual and collective rights and responsibilities? I left the apartment to throw out garbage. Instantly, my right ear got a horrible earache. As long as I am in my own place, it only hurts a little. Huh? I wish someone could look in there and tell me if I should worry, or just keep resting until it gets better. We don’t necessarily think alike, but what he’s talking about is similar to what I was talking about. I started writing this in the morning and now the clock is creeping towards midnight. I am so darned stiff and sore and queasy! 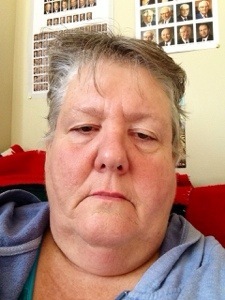 But….I would like to think my health has improved some today. 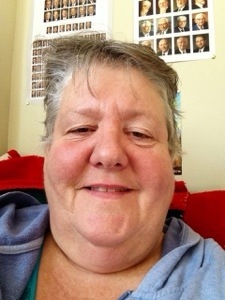 I am still struggling to understand CVID in combination with autoimmune diseases. There are the official versions from Wikipedia and health organizations and there are interesting stories in support groups. I am still trying to figure out if my history and here and now is a good fit and a way to look at, describe and treat my issues. I am still skeptical, but am learning all I can. Like I keep telling docs…I don’t care WHAT all this is called…just help me get better!!!!! I have had a horrible headache and have been nauseous for what seems like forever. It’s not getting any better. My strength is pretty much gone. I emptied out the cupboard full of spices so that I could write down what I have. I barely did that, then ran out of energy to hold spices and the strength to stand. Yuppers, I am still scared about what’s wrong with me. How can my head hurt THIS bad??? How can I feel so sick from something I can’t figure out? After I wrote that, I crawled in bed for three hours of body bending shivers and chills. Ugh…don’t feel so good. I could easily go another month without shopping thanks to mostly free food I have stockpiled. Yes!!!!! What a relief to have cleaner and brighter air! 🙂 I wish I could have gone outside to experience it. I put on clothes for 5 minutes or less this evening so I could check the mail. Luckily, nobody saw me. I look like death warmed over. My guts are not happy. I am experiencing a new sensation. I can see and hear gurgling through the hernia opening. Wow! Loud. Kinda cool, kinda eeeeew! So much for “not a creature was stirring” this Christmas Eve.